Noosa is one of Australia’s top beach wedding destinations. But like any event or holiday, planning the ultimate Noosa destination wedding can be overwhelming if you don’t know what to look for. Here’s our guide to planning your dream Noosa wedding without the stress. Located at the northern end of Queensland’s Sunshine Coast, Noosa hugs the eastern coastline with its pristine beaches, lush national parkland and serene sunsets. It’s premier shopping and dining precinct, Hastings Street is renowned for its high calibre boutiques and world-class restaurants. Noosa’s Main Beach sits below towering Noosa National Park, lined by Pandanus and native trees, stunning boardwalks and private bays, offering a unique Sunshine Coast wedding location for your special day. Working with a professional wedding or event planner that is familiar with the Noosa area can take a huge weight off your shoulders and make your wedding dreams become reality. Noosa wedding planners like Lovebird Weddings or CL Weddings & Events know what makes Noosa special. They can help you to find the perfect secret wedding locations, which event suppliers to source decorations and which Noosa wedding celebrants to recommend, as well as taking care of all the finer details to ensure your special day goes to plan without a hitch. Our event specialist will work with your preferred planner to ensure your Noosa wedding reception is styled and set to perfection and is the most memorable day for you, your family and friends. Bring a touch of Italy and sophistication to your wedding reception at Locale, one of the Sunshine Coast’s top wedding venues and rated in Trip Advisor’s top 10% of fine dining restaurants in Australia. Locale offers a range of wedding packages to suit your wedding size and style and can cater to both seated wedding receptions or cocktail style events. Book early to secure exclusive use of Locale’s stylish restaurant and classic contemporary lounge bar to create a truly magical and memorable wedding reception venue. Hosting a destination wedding gives you the opportunity to create a fun and exciting experience for both the two of you and your friends and family. A great way to give your guests a memorable holiday and wedding experience is to create an itinerary. Do your research first to learn about the area, places you’d like to visit or activities to enjoy with your guests during their holiday. Consider taking a trip to Noosa together as a couple to help get ideas, visit the places you’ve researched to see if they’re a perfect fit and if you’re hiring a professional wedding planner you can arrange to meet them on site to discuss your wedding plans. There are some incredible experiences to enjoy in Noosa, like riding a horse in the ocean with Noosa Horses, taking a romantic sunset river cruise with Gondolas of Noosa, hire a stand-up paddleboard and explore Noosa National Park from the water. When booking your trip to Noosa, be sure to contact our events specialist to arrange a time to meet and show you how our restaurant can transform into your ultimate Noosa wedding reception venue. While planning your ultimate Noosa beach wedding, take a trip to Noosa and enjoy your stay in bespoke, luxury accommodation. There are many remarkable holiday homes to be found on Air BnB where you can soak in the essence of Noosa, unwind from life and focus on visualising your perfect wedding day. The Shackpalace Noosa, for example, is perched high on Noosa Hill and offers an inspiring and unique holiday experience. Alternatively, if you love being on the water why not consider staying in a houseboat during your stay in Noosa – Waternest is a luxury floating home for two, stationed by a private jetty on the Noosa River within walking distance to Noosaville’s best restaurants and cafes. Catch the Noosa Ferry from Noosaville to Hastings Street shopping and dining precinct to explore Noosa’s beach wedding locations and pop in for a visit to Locale Ristorante + Bar. Your wedding is a special day to mark the celebration of your life together. From selecting the rings to setting the perfect date, venue, budget and guest list, planning your wedding requires a myriad of decisions that are best made between you. Why not enjoy the planning experience together? After all, at Locale we want both partners to be completely happy with your venue choice, the type of event you create (whether it’s a sit-down reception, cocktail style, pre or post-dinner drinks), table styling, menu and drinks package. 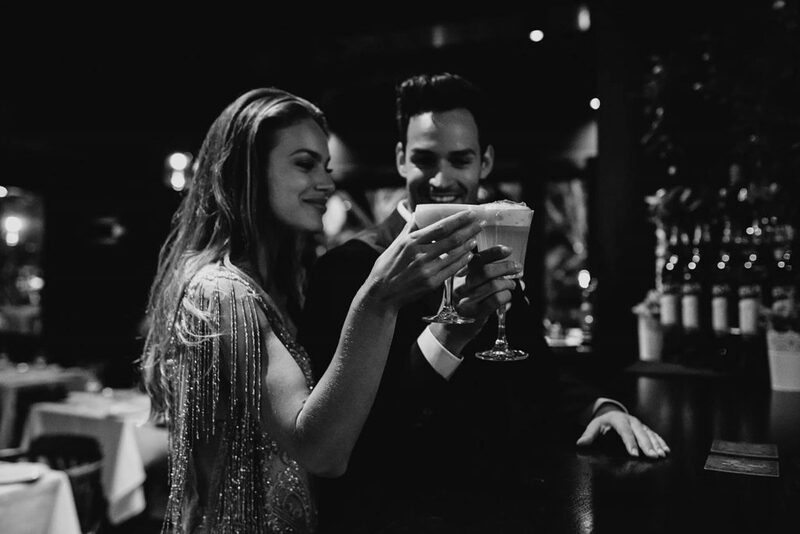 Whether you’re eloping in Noosa or looking for the best venue to host your Sunshine Coast wedding, we’ve put together our tips on what makes the perfect Noosa wedding reception venue.